A new advisory network, aimed at giving all areas of the construction industry a voice, has been launched by the Health and Safety Executive (HSE). The Construction Industry Advisory Network (CONIAN) is a newly formed stakeholder network, bringing together a wider representation of organisations and workers across the construction industry. CONIAN has been set up to provide a platform for sharing good practice and behaviour, and to reach and support those that need to improve health and safety performance. The launch event, held at the HSE’s Rose Court office in London on Thursday 7 December, brought together representatives from government departments, trade unions, construction businesses and trade associations. Speakers included Martin Temple, HSE Chair, Gail Cartmail, Unite’s assistant general secretary, and Fergus Harradence, Deputy Director for Construction at the Department for Business, Energy and Industrial Strategy. A new online community aimed at sharing knowledge, good practice and responding to risks from changes in the workplace and new technologies was also launched. “As part of our drive under Help Great Britain Work Well to promote broader ownership of health and safety, this inaugural event focussed on how the construction industry can work together through CONIAN to support, assist and take the lead in delivering objectives shaped around reducing risk. "The CCLG were delighted to attend and participate in the newly formed CONIAN meeting yesterday. 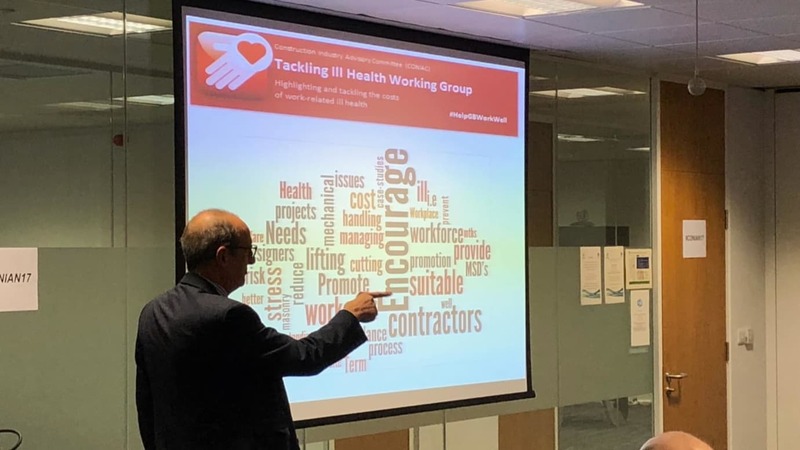 We are really pleased to see and be part of the HSE’s Help Great Britain Work Well campaign through the CONIAC Working Groups where the whole of industry is coming together to support better health and safety performance within the construction sector. “Industry representation and engagement at the CONIAN meeting yesterday was really impressive and the language used really reinforced the messages about improving industry performance in the widest sense in line with the Industrial Strategy for Construction. Well done HSE." CONIAN has been set up following the reconstitution of the Construction Industry Advisory Committee (CONIAC) earlier this year. CONIAC advises HSE and relevant stakeholders of emerging health and safety developments and risks in the construction industry, and agrees plans for the promotion of effective risk control. CONIAC is aligned to delivering Help Great Britain Work Well, HSE’s strategy for influencing everyone who has a stake or interest in improving health and safety in the workplace. CONIAC will be organised under the six themes of Help Great Britain Work Well: acting together, tackling ill health, managing risk well, supporting small employers, keeping pace with change and sharing our success. The launch of CONIAN within this newly formed structure provides a platform for the construction industry to promote engagement with workers to change behaviours and provides organisations with the direction on managing construction risks well.